Bad whole life insurance, the stuff that isn’t designed the way we suggest it should be, sometimes catches fire for its so-called poor returns. Those with something to sell you that isn’t life insurance (i.e. that competes for those dollars) like to focus on fees and talk about how terrible the product is. And in recent years, historical whole life insurance cash value performance reports from places like the now defunct Blease Research were used to try and claim that returns were mediocre and illustrations always overstated the performance of the policies. But prior to the peak in interest rates seen in the late 80’s/early 90’s whole life projections often understated the performance of the product. And when we go back beyond this point and look at a policy put in force several years prior, we see dramatically different returns. This is potentially really good news for the life insurance industry and its ability to deliver competitive returns on its products relative to the entire selection of financial products. 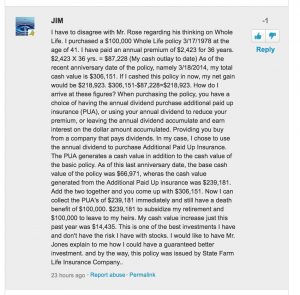 I recently stumbled upon an article published in July of this year that attempts to make the claim against whole life insurance. The article itself is total rubbish and referencing it here would seriously demean our attempt to provide high quality/intelligent content. Additionally, the article itself is not really important to my point. While the article blathers on for nearly 1800 mind-numbing words in a way that the author probably thought was really slick but is more just confusion of concepts, platitudes, and other useless drivel, there is one interesting tid-bit from an otherwise internet waste-of-space article. The always beloved comment section. If we calculate the compound annual growth rate using that premium and his current cash value we get an annual rate of return of 6.27%. Not bad from a non-blended whole life policy issued by a company that basically forsook the product several decades ago. Just as we learned some time ago that blended whole life insurance does work with a historical proof to back it up, non-blended whole life hasn’t fared all that badly either. Though I’d much rather have the returns we saw in the case of the blended policy, we can take comfort in knowing that the foundation of the product (and even the companies that aren’t really that focused on the product) can certainly deliver good returns. 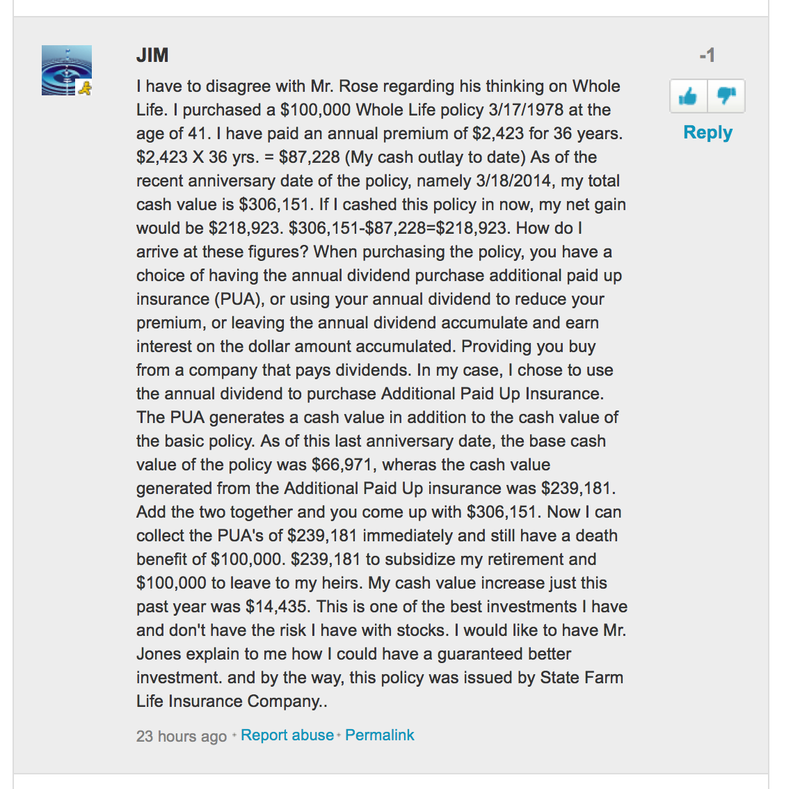 Even the bad whole life insurance turns out to be not so bad.